A number of high-ranking Democratic senators combined to contribute tens of thousands of dollars to Sen. Robert Menendez's (D., N.J.) campaign committee this year, a review of Federal Election Commission records shows. Menendez, who was indicted in April 2015, is currently facing 12 counts of corruption charges that include bribery. Prosecutors have said that the senator had a "corrupt pact" with Salomon Melgen, a wealthy Florida eye doctor, a previous donor to Menendez's campaign. Menendez himself has contributed to the campaigns of a number of top Democratic senators this year from his leadership PAC, the New Millennium PAC, the Washington Free Beacon previously reported. Some of these Democratic politicians used their own leadership PACs to donate to Menendez's campaign committee just days after Menendez had used his PAC to give to their campaigns, leaving their leadership PACs drained of identical amounts while increasing their respective campaign donations almost identically. Menendez sent two checks totaling $10,000 on February 24 from the New Millennium PAC to Sen. Tim Kaine's (D., Va.) campaign committee. Kaine's leadership PAC, the Common Ground PAC, then sent two contributions totaling $10,000 on March 6 to Menendez's campaign for both the primary and general election, records show. Menendez then sent $5,000 from his PAC to Sen. Elizabeth Warren's (D., Mass.) campaign on March 9. On March 22, Warren's leadership PAC, PAC for a Level Playing Field, gave $5,000 to Menendez's campaign. Warren sent an additional $5,000 to Menendez's campaign on March 31. Menendez then made two $5,000 contributions to Sen. Jon Tester's (D., Mont.) campaign on March 28 from his PAC. Three days later, on March 31, Tester's leadership PAC, the Treasure State PAC, sent two $5,000 donations to Menendez's campaign committee. On June 28, Menendez sent $5,000 from his PAC to Sen. Chris Murphy's (D., Conn.) campaign committee. One day later, Murphy gave $5,000 from his PAC, MURPHPAC, to Menendez's campaign. In one circumstance, the donation was made to Menendez first, who then returned the favor the very next day. Sen. Debbie Stabenow's (D., Mich.) leadership PAC, the Great Lakes PAC, cut two $5,000 checks for Menendez's campaign committee on March 22. On March 23, Menendez gave Stabenow's campaign two $5,000 contributions from his PAC. Menendez also donated to the campaign of Sen. Kirsten Gillibrand (D, N.Y.) this year. Gillibrand did not donate to Menendez's campaign from her PAC, according to records. Other prominent senators who did not receive campaign cash from Menendez's PAC added to his campaign war chest this year. Sen. Cory Booker (D., N.J) used his leadership PAC, the Purpose PAC, to make two $5,000 contributions to Menendez's campaign on February 2. Booker, who was mentored by Menendez and appeared at the first day of his trial, has also given $20,000 to his legal expense fund, the Free Beacon reported. Sen. Kamala Harris (D., Cali.) used her leadership PAC, the Fearless for the People PAC, to donate $5,000 to Menendez's campaign on June 27, records show. 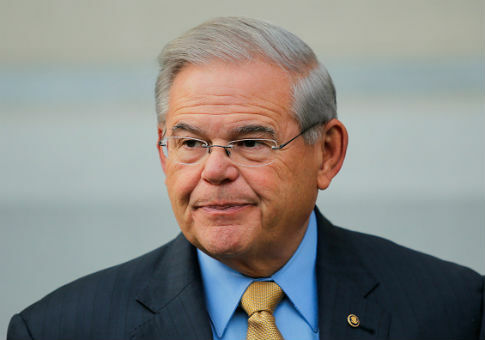 "Senate Democrats have continued to stand by disgraced Senator Bob Menendez even as New Jerseyans and the rest of the country have been disgusted by his blatant corruption," Bob Salera, a spokesman for the National Republican Senatorial Committee (NRSC), told the Free Beacon. "Democrats will have to answer to voters about why they propped up a crook by financially backing him while he was under federal indictment for accepting bribes." Politico reported Wednesday that prosecutors have rested their corruption case against Menendez, who has maintained his innocence since the beginning. None of the Democratic senator's offices returned a request for comment on their donations to the embattled senator's campaign by press time. This entry was posted in Politics and tagged Robert Menendez, Senate Democrats. Bookmark the permalink.